First, this is going to piss a lot of people off…and I don’t care. Here’s why: if you’re an orchid enthusiast, you’ll understand the troubles and frustration of not knowing what an orchid is. What does it look like when it’s not in bloom? When will it bloom? How do I make it rebloom? How do I care for it? What temperature range is required? How much water does it need? All of that is relevant and super important when you’re growing a bunch of plants but need to tailor the care for individual plants. If you have a NOID, you’ve been out in left field with a blindfold on…until now. You have to do a LOT of research. You have to be very crafty about finding comparable plants to your NOID. I use google, and facebook groups, and other orchid sites. You need to look at everything: flower form, size, shape, colours, patterns, fragrance, you name it. You have to find the plant that is the exact match to the orchid you own. It’s not easy, but you’d be surprised how a little bit of research can go a long way in helping you find a comparable plant and ID. You have to clarify that it’s a guessed ID. Once you find the orchid name that you THINK your plant is, you can’t just write it on a plant tag and call it a day. You HAVE to make a notation that indicates it’s a guess (you know, just in case you get hit by a truck tomorrow and someone sells off, or gives away your collection of plants). How do we clarify we’re guessing an orchid’s name? We (ALWAYS DO THIS) add, ‘cf.’ to the name. Example: Aliceara cf. Winter Wonderland ‘White Fairy’. In plant-naming nomenclature, ‘Cf.’ is short for the Latin word confer, or “compare with”. You can also just add a question mark ‘?’, and others just add ‘NOID’ to the end. I write it “[cf. ]” because the brackets are easier to recognize in my orchid collection spreadsheet. On the tag I have written, “Miltoniopsis cf. Herralexandre” and it might not be Herralexandre (maybe it has a higher prevelenace of one parent, maybe it’s a complex hybrid that worked out to look the same, who knows). Most importantly though, I’m now able to differentiate this plant from the other 3 “NOID” Miltoniopsis I own. It also helps me understand cultural requirements (or at least have a kick-off point to research) about the care of this specific plant, because there’s a good chance that the parents of this plant are similar to the parents of a Miltoniopsis Herralexandre. We cannot outright rename the plant though, right? There’s a BIG chance that the parents are not true “Herralexandre” and we’ll never know if it truly is or isn’t. As you can see it looks nearly identical to this Dtps. Tying-Shin Champion Cinnamon and because “Dtps.” has been reclassified, the genre needs to be aligned to “Phal cf. Tying-Shin Champion“. As a reminder: you will NEVER know the true name of an unnamed orchid. “Once a NOID, always a NOID”; It’s just too complicated to know for sure, when you consider the vast number of hybrids available and the large array of outcomes of those hybrids. That said, you do have consumer demand on your side. Most (if not all) of your big-box retailers are going to lean toward reliable cultivars and hybrids of proven orchids—with the number of plants that these retailers produce, it’s just too risky to go producing hundreds of thousands of unproven hybrids, so there are often a reliable set of “standard” orchids that are very vigorous, beautiful, and also easy to care for. My buddy Nestor points out that it’s important to emphasize that this is done for our own categorization and knowledge. You should never title these plants as parents when breeding (and likely shouldn’t use them at all if you’re planning on large-scale production). Be mindful that, even if you think you have something IDd you could (and likely are) still wrong. Tread carefully in the territory of naming unnamed plants, but use it for your own benefit. With experience you’ll come to be able to identify traits of individual species and what to expect from them. 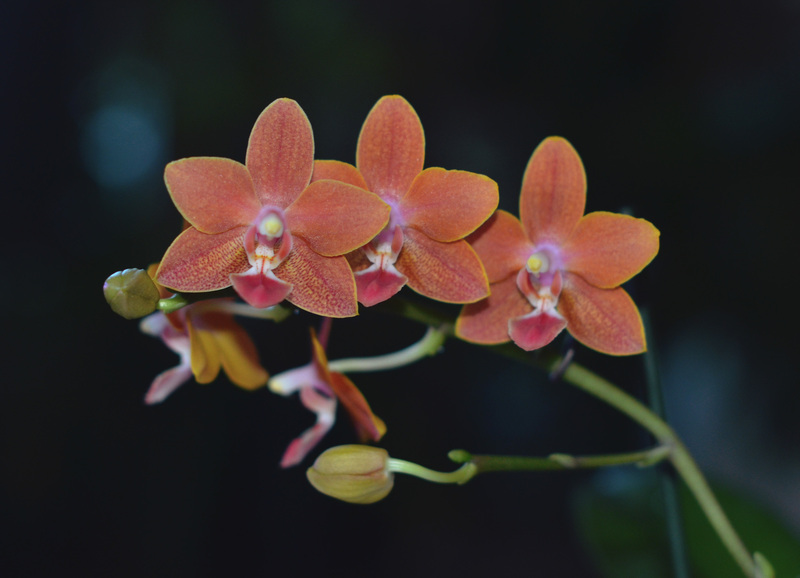 This can also give you a good kick-off point for understanding the care requirements of your orchid as well as potential identifications characteristics within hybrids. For example, Phalaenopsis equestris imparts spotting on the two bottom petals, as well as a higher prevalence for keikis production, and miniature flowers. Similarly, Phal venosa often imparts tones of orange. Phragmipedium kovachii imparts BIG flowers into it’s hybrids. Phragmipedium besseae provides tones of bright red, and coral into it’s offspring. Okay, so you bought a new plant. Let’s pretend it’s the yellow one pictured above. It’s time to start the search for a potential ID (and you probably want to do this before the flowers drop, otherwise you’ll forget exactly what it looked like). Begin the search by heading over to Google; search for the visual traits and browse the options in the “images” tab of google. Example: “Phalaenopsis yellow flowers“; browse the flowers that look similar–the goal is to find an EXACT MATCH. If you can’t find an exact match, look at comparable flowers and check the parent lineage and compare other potential hybrids of that parent. I warn you, this takes a bit of effort. You can check parent lineage by searching the name of the parent hybrid, or species on the “Blue Nanta” site. Scroll down to the bottom and you’ll see the parent lineage (as well as offspring), select one of the parents and dive further by going back to google and search the parent species and include an “x” to denote hybrid. Example: “Yellow Phal amabilis x”. Eventually from all of this digging, I can sometimes find a comparable flower and in the case of the above orchid we’ve found, ” Dtps. King Shiang’s Baby ‘Yellow Kitty’ ” as a nearly identical match. I’ll then research Blue Nanta for the name in an effort to confirm that the hybrid is legitimate–which in this case, “King Shiang’s Baby ‘Yellow Kitty'” does not appear to be on BlueNanta so it may not be a registered hybrid. Also, “Dtps” has actually been reclassified to Phalaenopsis so I have tagged it, “Phal. cf. King Shiang’s Baby“. Sometimes it takes me a while to find a comparable flower. 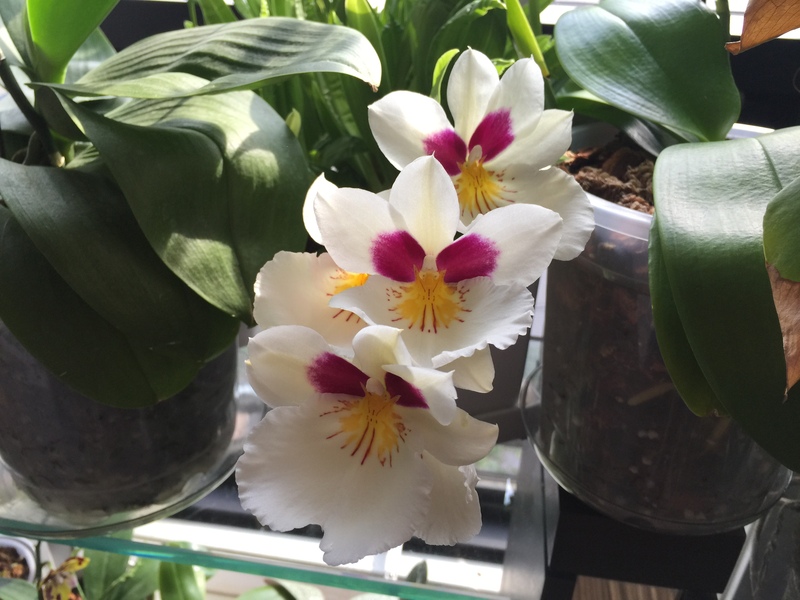 I’ll forget about it and then one day I’ll see it pop up on a Facebook group, or a forum while I’m searching for other things and I’m like, “THAT’S MY FLOWER!”—and I’ll update my orchid tag and spreadsheet. This is for your reference, sometimes you’ll find one that looks similar, but later you’ll find one that looks the exact same. Example: my above Phal cf. Tying-Shin Champion ‘Cinnamon’ used to be tagged as, Phal cf. Tzu Chiang Balm. But always remember to include the ‘cf’ reference. I hope that helps solve some of your woes with recognizing (and caring for) your NOID orchids. Just remember, at the end of the day, if you’re not breeding and selling your plants, how you label, tag, and track your collection…is entirely your choice. Orchid rant: A NOID is always a NOID!! !